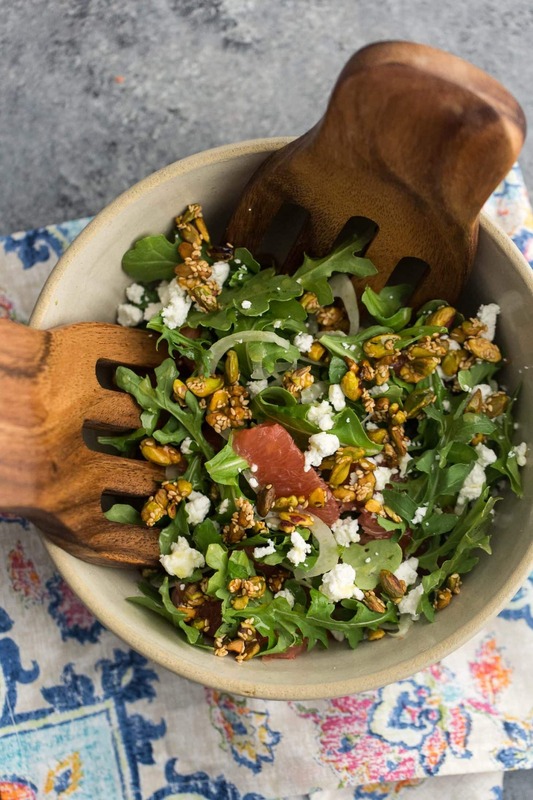 Grapefruit Salad with Sesame Pistachios | Naturally. I recently had a citrus salad at a local restaurant that left me wanting. The salad was okay but I felt that I could do better, which is where this grapefruit salad enters. 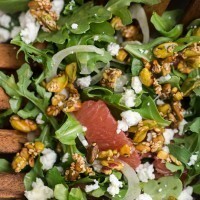 The grapefruit and fennel combination is not to be missed and the sesame-pistachios put this salad over the top. If you’ve never tried citrus in salads, this is a solid place to start (even if you may be a bit hesitant with the grapefruit). Preheat oven to 325˚. In a bowl, toss together pistachios, sesame seeds,honey until almonds are well coated. Spread out into a single layer on a parchment covered sheet tray. Roast for 14 to 16 minutes until sesame seeds are starting to brown. Remove and set aside, letting cool completely. While the pistachios are roasting, supreme the grapefruit (see note) and place in a bowl along with the arugula, fennel, and goat cheese. One nuts are done and slightly cool, add roughly half to the salad. Whisk together the dressing ingredients in a small bowl, pour over salad, and toss until the salad is mixed and well coated with dressing. Serve with the extra pistachios. The individual components of this salad are good but when combined together in this salad form, each plays a crucial roll. 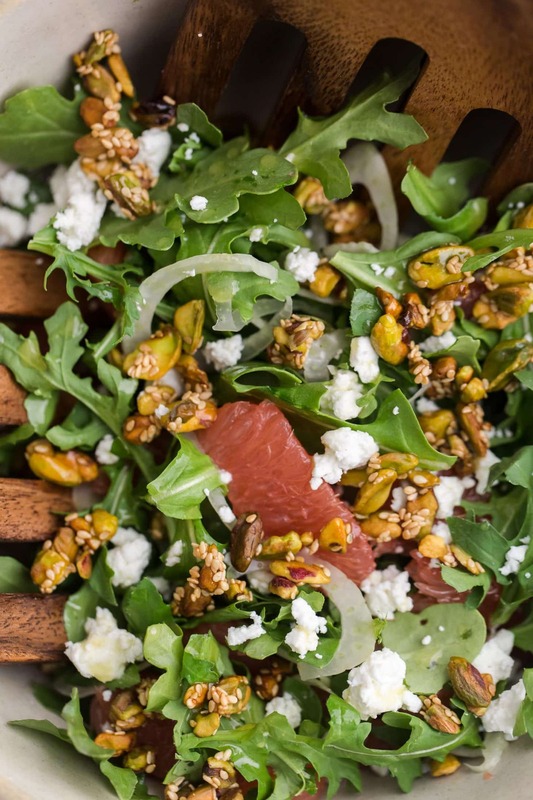 The slight tang from the grapefruit is balanced with the creamy goat cheese while the peppery arugula plays nicely with the nutty pistachios. To date, this is one of my favorite salads. Greens: A butter lettuce or even spinach would work well in place of the arugula. Citrus: I’m not the biggest grapefruit fan by itself but this salad is a different story. However, you could also try oranges if you’re unable to find grapefruit. Nuts: This isn’t the first time this nut/sesame seed combination has appeared in one of my salads. Almonds work particularly well for this and I’ve also been known to use hazelnuts. I am a majorly open DESPISER of grapefruit. If that’s even a word 😉 I’ll admit that it looks beautiful but I think it tastes GROSSSSSS! However, the sesame and the pistachios look stunning in the salad! I would love to try this with slices of lemon or oranges as well! I just did an arugula salad with a grapfruit vinaigrette and totally loved it- can’t wait to recreate one with the fresh fruit in the salad itself 🙂 So yum! I love the idea behind this salad! 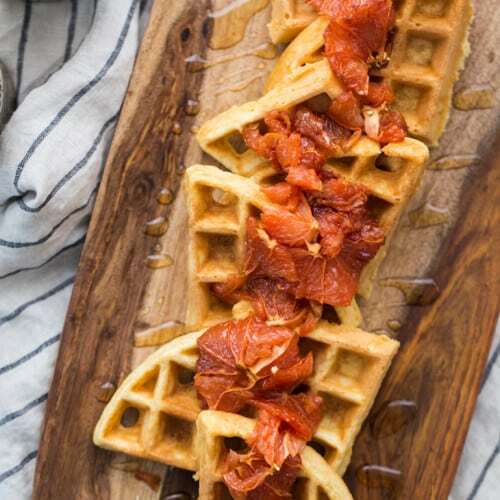 The citrus would be an amazing addition – I am hesitant to add grapefruit as a lot of the people at my table are grapefruit haters… but oranges are a good idea! Great recipe! Thanks for sharing! I don’t mind grapefruit and I think this is a delicious salad! Oh I love citrus with salads! I am definitely not a salad person but this one time, I was served some pasta dish with a salad at the side that was loaded with rocket and oranges. I.FELL.IN.LOVE. ! In fact, I wanted more of it! But somehow, I never got around to making it or recreating it and totally forgot about it until now! Your version with grapefruit + pistachios + sesame seeds is so refreshing! I need to make this! This is gorgeous! And so simple. I love it and can’t wait to try it out! Thanks!! Omg does that look good! My coworker just gave me grapefruits and I had no idea what to do with them… So happy I stumbled on your site. Going to give this salad a try.